Mouriya strictly selected cows are the nulliparous heifers that inherit the blood of Tajima cows that are breeding cattle of Kobe cows, and are fattened more than 32 months and avoid inbreeding Tajima cows themselves in Hyogo-ken, being proud of the stable production of hight quality cows for beef. In the Mouriya contract pasture which is in Yabu-shi, the hometown of Tajima cows, they are grown with the same feed and in the same cowhouse as genuine Tajima cows, and the beef is not inferior to Kobe beef in taste and flavor. 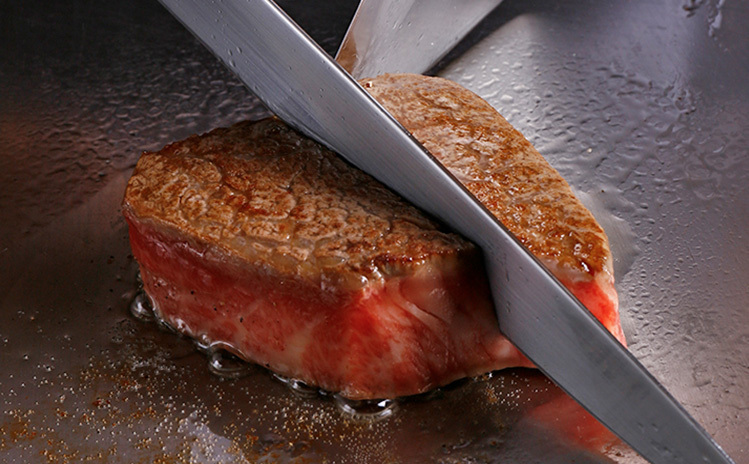 Kobe beef is of high quality meat of course, but the expensive price is a bottleneck. (Recently the market price has gone up considerably. 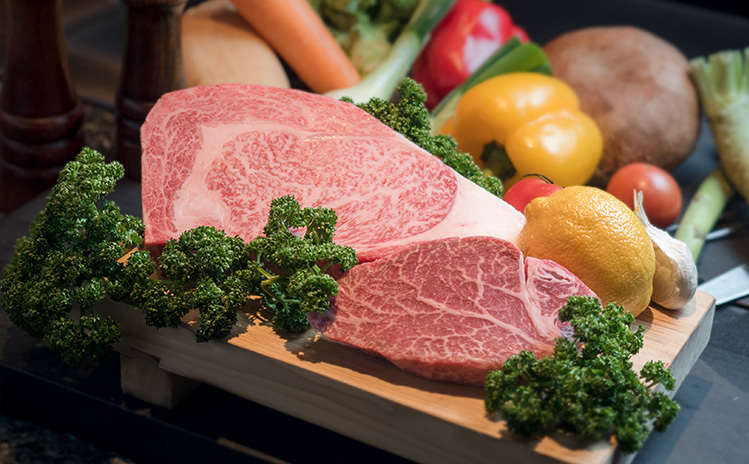 Mouriya recommends to the customers the Mouriya strictly selected beef which is not inferior to Kobe beef in quality at the reasonable prices. Please appreciate the beef by all means. Tajima cows are the breeding cattle of Kobe cows. Kobe cows are not such species of cows but the brand. They are ranked by the fact that they are fattened by the specified livestock framers registered at Kobe Meat Circulation Promotion Committee from among Tajima cowd or slaughtered at the specified meat centers in Hyogo Prefecture. 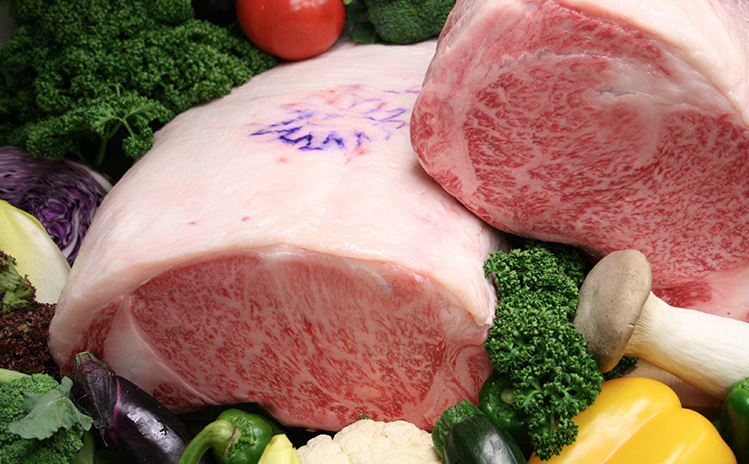 Such ranking is classified such as class-A or class-B by the above-mentioned fact, and the BMS value (value indicating marble patterns), for example, more than 6 becomes Kobe beef. Originally, Tajima cows inhabited the old Tajima province (northern part of present Hyogo Prefecture ) in such an environment as clear air and water as the name shows and ate wild grass grown on the fields.They had naturally the capability of being high quality meat and such capability of wonderful brand become flourished through the industious fattening by cattlemen, we believe. Moreover, the cross-breeding with the cows of other pefectures is not performed to differentiate the brand cows of other prefectures, thus keeping closed breeding. Only Hyogo Prefecture is doing so. Kobe and Tajima cows are physically small, and their meat is delicate and the fat is not thick and plain, and you can enjoy the taste and flavour. There is no gorgeousness of marble patterns, but it has refined taste and it is a dish that you can understand when you have it. We do not buy the cows even if they have won the highest award given by the promotion committee. Mouriya has valued the blood of Tajima cows since a long time ago. To say nothing of pure-bred Kobe cows and Tajima cows, the cows that are Monjiroh of pure-bred Tajima cattle from Hyogo Prefecture popular outside the prefecture and the cattle strongly inheriting Anfuku, are also treated as Mouriya strictly selected ones. Mouriya keep in stock strictly day by day to present valuable meat to customers, and we decide on the price not by the wholesale price but by the value of meat. Eventually even the cows awarded the first prize by Promotion Committee are not neccessarily valued as such, and we do not buy the cows depending on the title. If the cows awarded the first prize are truly valued as such, we buy them and sell the beef with confidence. We treat class A4 and A5, and in case of marble patterned meat we consider the quality of fat and taste, the delicacy of meat, the maturiy of meat when we buy in stock. Since the best beef handled by Mouriya is also the best in the world and we are confident of that. Please appreciate our dishes by alll means.